The Frozen Hearth is an inn located in the city of Winterhold. It is one of the few inhabited buildings in town and is a gathering point for the remaining residents. 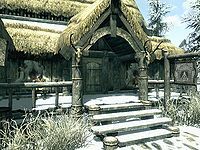 It is located in the center of town, across the street from the Jarl's Longhouse. Dagur tends the counter, buying and selling food and drinks and renting out rooms for 10 gold, while his wife Haran serves the customers. It consists of two areas, The Frozen Hearth and The Frozen Hearth Cellar. 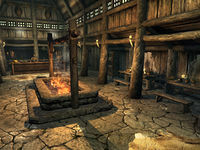 Like many other taverns in smaller settlements, The Frozen Hearth consists of a huge taproom with a fireplace in the center and the counter in the opposite end of the room from the entrance. Several wooden tables are scattered around, all of them set with food and drink. In addition to the taproom, the inn also has three smaller rooms with single beds, one of them reserved for paying customers. To the right of the front door, in the southern corner, is the first table which is dressed with two salmon steaks on wooden plates, an eidar cheese wedge, some sliced eidar cheese, an eidar cheese wheel, a goat cheese wedge, a goat cheese wheel, some bread, and one bottle each of wine and alto wine. In the corner stands a single food barrel, while a similar barrel can be found in the adjacent corner to the east. Next to the barrels are another table with two loaves of bread, and more wine and alto wine, two bottles of each. The next table is where you can find local drunk Ranmir around the clock. The table in front of him is dressed with three loaves of bread, two bottles of alto wine, and one bottle of regular wine. Next up is a set of shelves with two elves ear, six bottles of Nord mead, and Wylandriah's Satchel, needed for the quest Hunt and Gather. The last table for paying customers can be found between the entrance door and the room for rent. It is set with two chicken's eggs, a bottle of wine, and a loaf of bread. The bar takes up most of the northwestern part of the taproom and Dagur can be found behind the counter 24 hours a day. On display is a wedge, a slice, and a wheel of eidar cheese, and the same of goat cheese, a bottle of wine, and a bottle of alto wine, along with a salmon steak. Hidden on the shelves underneath the counter are five gold coins, an iron war axe, a coin purse, six bottles of alto wine, two bottles of wine, and a copy of the book Herbane's Bestiary: Ice Wraiths. In the western corner is a set of shelves with two bottles of alto wine and six of regular wine, along with four loaves of bread. Next to the shelves are two food barrels. Hanging from the ceiling, above the stairs leading down into the basement, are seven dead rabbits and two pheasants. Hanging next to the game are a few ingredients, including two garlic braids, some dried elves ear, and some dried frost mirriam. The room you can rent is the second room along the western wall, closest to the bar, and contains a single bed, a dresser with random clothes, a chest with minor loot, and a copy of Walking the World, vol XI. The neighboring room can be used by any of Eirid, Haran, and Dagur. It contains a wardrobe with clothes, a copy of Nords of Skyrim, a chest with some loot, and a bottle of Black-Briar Mead. Adjacent to these two rooms are another room, reserved for permanent resident and former College of Winterhold member, the wizard Nelacar. It seems like he has been living there for quite some time and it resembles a small trading room, complete with a counter with a copy of the rare tome Words of Clan Mother Ahnissi and two bottles of alto wine on display. On the shelves underneath the counter is the staff of arcane authority used for the quest Some Light Theft. Behind the counter is a set of shelves with Nelecar's personal library, several books on Daedra, and a single bottle of alto wine. In the southeastern corner sits his owned bed with an empty chest at the foot. 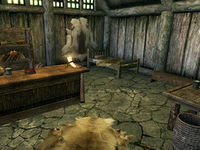 In the corner is a chair where Nelecar usually sits, and a table with an iron dagger, a coin purse, and four gold coins. Down the stairs from the taproom is the cellar where Dagur's wife Haran sleeps next to their child, Eirid. The door opens to the sight of three food barrels and a huge amount of cobwebs, hinting at the decline of Winterhold. In the sleeping area are two owned beds, one single and one double, whereas Eirid sleeps in the single bed, next to a basket with five green apples. In the corner is an end table with clutter, with two bottles of alto wine on top. At the foot of the double bed is a chest with even more clutter and a few gold coins. In the corner sits another end table with a coin purse on top and, on the floor, four food sacks. There is also a wardrobe with some random clothes and another food barrel. 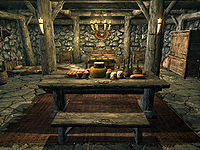 In the center of the sleeping area is a dinner table set with a healthy amount of food, including three red apples, three green apples, an apple pie, two sweet rolls, a goat cheese wheel, an eidar cheese wheel, a wedge of goat cheese, three loaves of bread, two bottles of alto wine and two bottles of regular wine. Adjacent to the dinner table is a storage area with several inactive crates and three food sacks and, wretched between a crate and a pillar, the Restoration skill book The Exodus. In the other end of the room, behind the empty table, are three more food sacks and a food barrel. This is the merchandise found in the Frozen Hearth's merchant chest. These items are only available if purchased from the merchant; they cannot be pickpocketed or stolen. They are restocked every two days. If you infect Haran with vampirism during the New AllegiancesDG quest, a coffin will appear in the westernmost corner of the cellar and can be used to sleep and get the vampire rested bonus. Haran does not seem to use it however, and will still sleep in her old bed.